This is a recipe for the very popular and traditional Dobrada Guisada, which is Portuguese Tripe. Tripe are the intestines of the cow and dobrada guisada is a very famous dish historically, originating in Porto. This dish is to be served for many and combines different vegetables along with the meats to make a dish which is amazingly flavorful. This dish is one of my favorites because of that and exemplifies what makes Portuguese cooking so great. 1) Cut the cleaned tripe into small pieces and simmer in a saucepan with salted water on low heat until tender, about 2.5-3 hours. 2) Bring the beans to a boil with some water in a saucepan. Remove from the heat and allow to stand in the hot water for one hour. 3) In a separate saucepan, simmer the chopped chourico and bacon in a little water on medium to low heat for about 30 minutes. 4) Add sliced carrots and one sliced onion. Simmer until all is tender. Drain and keep the broth. 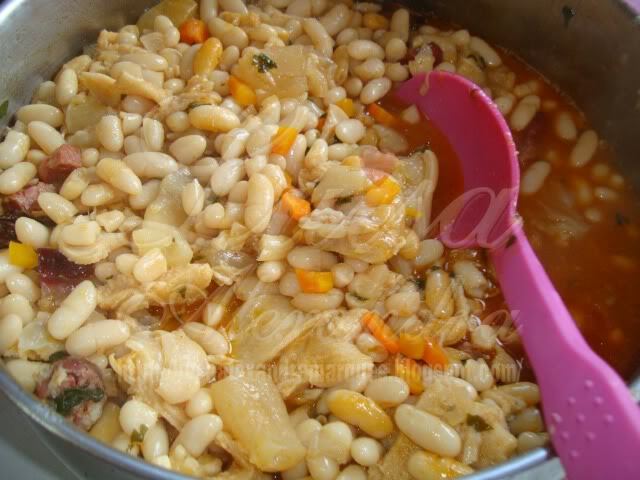 5) Fry the remaining chopped onions in butter and when well browned add the meats, beans, vegetables, finely chopped parsley, black pepper, bay leaf and cumin seed and one pint of broth. 6) Cook for another hour adding a little more broth if necessary. 7) Once done, serve with boiled rice. There should be a ‘Like’ button for this recipe because only know I learned about the portuguese style of cooking tripe, thanks to an interesting comment left on a Gordon Ramsay tripe recipe! I’ve got to try this! Beef Tripe is not the cow’s intestines but the cow’s stomach. The cow has four stomachs, three that can be used for human consumption. The common tripe used is honeycomb tripe in most recipes. Thank god somebody corrected you about the “cow’s intestines” mistake! Shame on you for not knowing what the basic meat element of your recipe is! Of course Diego Gonzalez is correct. All I can add is that dobrada, which means, roughly “more than enough” and refers, I think to the fact that ‘leftovers’ can always be stretched to serve company, is a Porto receipe originally, and is delicious!